PhotoFast, the company behind the PhotFast EVO cross-platform flash drive has just launched a crowdfunding campaign on Indiegogo for its next project, the MemoriesCable. The MemoriesCable is a neat-looking combination of flash-drive and compact USB to lightning charging cable for iOS devices. It aims to solve a couple of common probable for most iDevice users, which is, we never seem to have enough power and/or storage space. What do you do when you run out of space on your device? With no way to add storage to the your sealed device (like on the Android side of things) you are often forced to delete downloaded movies, photos or apps to free up some space on your device and then kick yourself for not spending more money on that larger more expensive model as you ride out the remainder of your contract. The MemoriesCable addresses both these issues by both automatically backing up and charging your iOS device just about anywhere, even without a network or computer. Plus you have plenty of off-device storage for all of your movies so you have them where and when you need them, without taking up valuable space on your device. Available in several capacity sizes and price points, the 16GB – 128GB MemoriesCable allows you to carry all of your movies, music and photos with you. PhotoFast’s free iFlashDrive One companion app allows you to access the content you’ve stored on your MemoriesCable, whether it be photos or videos from your camera roll, cloud storage files from Dropbox and Google Drive, or from other social networks like Facebook Instagram and Flickr. 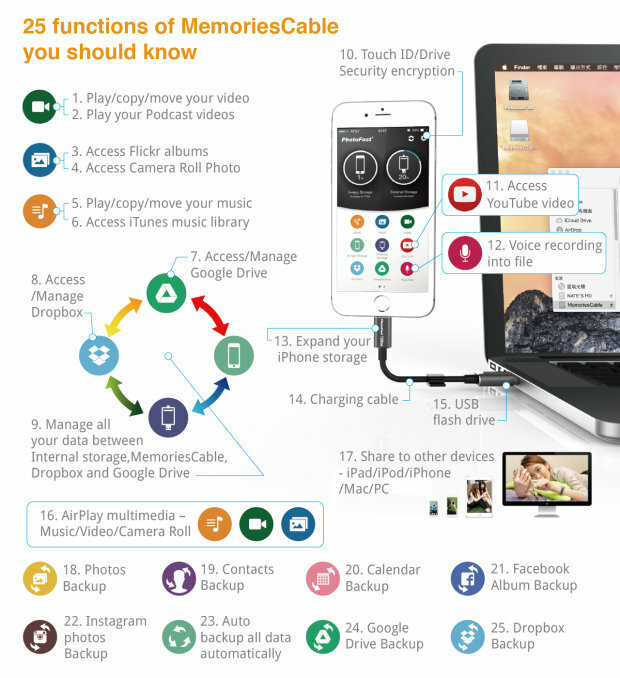 Backing up your device to the MemoriesCable is as simple as pressing a button and video and photo content can be displayed on other large screen devices via AirPlay. you are concerned about security, files and folders can be password protected and even accessed conveniently via Touch ID. At just 5 inches long and no bigger than a typical USB cable, this device is super light and portable. Available in both USB 2.0 and slightly more expensive USB 3.0 models, you can back for a single 16GB MemoriesCable for as little as $49 with an expected delivery date of next month, which offers a significant savings over its $80 retail price. To see the full list of backing options please visit the Indiegogo campaign page. This looks like a really awesome product and I should be putting it though its paces very soon with a full in-depth review, so keep an eye out for that. In the meantime I suggest you check out the campaign page for even more details and/or to back the project for your very own MemoriesCable. You can also visit PhotoFast on Facebook, follow them on twitter or checkout their full line of products on their official website.